A day of Community Team Prototyping took place Friday July 10, 2015; 8:30am - 4:30pm at the Golden Civic Centre. Charles Holmes facilitated the discussion and prototyping. As originally planned, this event could have resulted in the evolution of community-based decision-making and resource allocation in Golden & Area A. Now, it is up to all participants and residents to determine where this process will go - and how deep. While Charles has experience working with world leaders, he was brought to Golden because he came recommended by leaders in small communities like Salmon Arm, Bowen Island & Banff. Charles "help[s] diverse groups build consensus among stakeholders, build shared vision, and develop strategies for co-creating results." A general public invite was made online, while over 80 local leaders were personally invited - many of whom were carefully selected as potential Community Team members. Thirty people attended the majority of the full-day session. There is clear agreement that there is opportunity to enhance collaboration amongst and between different organizations in the community of Golden. Where, why and how collaboration is strengthened and advanced is not necessarily as clear. This workshop is intended to build shared understanding of the background work that has been done and; together, identify what might be done going forward. The recommendation to create a “Community Team” has been made. What this looks like and means, and whether or not it is an idea the community wants to pursue, will also be explored. The purpose of this meeting is to think together about how best to organize individual and collective efforts to support the future well being of the community. Greater understanding of the current reality: where collaboration is working well as well as where it might be improved. Enhanced understanding as to why – or why there isn’t – a need for change. Insights and learning about effective collaborative tools and where there might be specific opportunities to apply these. A list of ideas, approaches and specific opportunities for enhancing collaboration. Commitments to clear next steps. Here is a summary of Peter Block's "Community: The Structure of Belonging." The following notes were summarized by Charles Holmes. 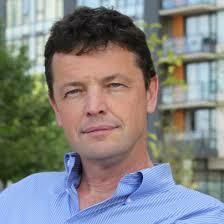 Charles introduced the group to the work of Peter Block and the 6 conversations of accountability and commitment. Participants had a chance to reflect and practice with this work. Other content included the Ladder of Inference and dialogue on listening skills. In small groups, participants reflected on collaborative efforts that have worked and identified contributing factors. It was acknowledged that there are many examples of effective collaboration. - Sharing of efforts related to Social Services in the community. A number of people (including Elina & Steph, et. al.) agreed to meet to identify how these could be more effectively integrated. - Creation of a hub that integrates "back end" services was discussed but no commitment made. - Of all the actions identified it was clear that the most important to the group is the creation of a Community Team, with a coordinator. The challenge; however, is that there is no funding. It was agreed that Caleb Moss would take the lead in creating a recommendation to be presented to CBT. This is agenda did not include specific times as our goal was not to follow or force a specific process. If there were more important topics, issues or concerns that arise, relative to the Desired Meeting Results, the group took the time to hear, understand and discuss them. A short FAQ on Community Teams can be found below. How are decisions made in Golden? Ans: Golden & Area A is an anomaly where the municipal and rural areas have roughly equal populations (~3,350 residents each). This even split results in a duplication of processes for each level of government. Add in the CBT, and one has 3 "major supporting bodies" in the community, often making decisions in absence of communication. Groups are aware of this gap as they make separate requests to each entity. This system adds to community knowledge gaps and in some cases, raising competition between groups. How are resources allocated in Golden? Ans: Community resources, in the form of non profit funding, are allocated in many different ways in Golden - and that is the fundamental challenge with the current situation. CBT has 14 different funding programs, some with local input (like the CBT CIP/AAP), many without (Community Directed Funds - small & large streams). The Town of Golden and CSRD Area A have 11 shared service agreements, along with 2 separate "Grant In Aid" programs. Further, local government allocates Economy Opportunity Funds (gas tax) and Payment In Lieu of Taxes (BC Hydro's PILT) funds in a way that is not widely understood. Service clubs (Lions, Rotary, Masons, etc.) and the Community Foundation have their own separate granting programs. Overall, it's a hodge-podge of methods, grant sizes and areas of focus which allocates ~$850,000 annually to this community. Is it wrong? No. Can we do better with our limited resources? Yes. Who wins & loses in current decision-making and resource allocation? Ans: Those groups with a place at the decision-making table currently win with respect to resource allocation. Certain groups receive core funding or regular project funding. Many smaller groups do not have the capacity or knowledge how to get to that table, even though their interests and activities are no less valuable. What are other communities doing? Ans: A lot! Some have paid coordination of CED or Social Development. Others have a broad, community development table. All are SUPPORTED by the local government. See "Other Community Models" for more info on how some small, western Canadian communities are coming together to do better. What does a Community Team look like in Golden? Ans: That depends. Currently, there isn't one. We can design it to best fit our current and future needs. There are some examples of 'communities of practice' and community models. Who is on a Community Team? Ans: Ideally, Community Team members would be those that are trusted, selected, and nominated by a "group of groups" who have a similar focus (trails, sports & recreation, health & social services, business organizations, etc.). These individuals may be staff or volunteers that have a set of skills, experience and trust developed over time in their organization and are believed to have a holistic and inclusive view of the community. They have most likely worked well with other local organizations and realize that we can do better together. These individuals could then be approved by the management group (usually the entity that is ultimately responsible for the majority of available funds), like the Town of Golden or CSRD. There could be room for an additional 'alternate' from each 'group of groups,' so that mentoring and succession planning can be built into the system. Some of these Community Team members may choose to run for local political office in the future. Or retired local politicians may choose to share their skills on the Community Team. What does a Community Team do? Ans: They work together as a true team - identifying community issues, setting priorities, designing projects, seeking outside resources and allocating community resources. However, they can only do what they are empowered to do, and supported to do. Therefore, it is up to the sponsoring organizations (again, most likely local government) to help frame what they can and cannot do. What resources does a Community Team need? Ans: A Community Team needs recognition and endorsement that it is representative of the community's groups and interests. It needs to be support with a coordination. Who does a Community Team report to? Ans: A Community Team reports to the community, their representative stakeholder groups, and the program sponsor like local or regional government. What does a Community Team do? Ans: A Community Team is a group of nominated and appointed local volunteer leaders that focus on strategically addressing the gap of local government's focus on 'water, sewer & roads' and many organizations seek to improve the quality of life for all residents. There are many models of community teams in practice. One based on the Constellation Model seems to make sense for many communities - including Golden & Area A. How does a Community Team receive input from and report to the community? Ans: A Community Team requests input from and reports back to the community in a planned and open way. Members of a Community Team would seek out and consolidate various input from 'groups of groups' and provide that input to the Community Team. The Community Team would then craft a plan for addressing the prioritized issues and report back to the community and stakeholders on their progress. Throughout the course of this project, we encouraged local leaders to ask these questions above and design responses using prototyping techniques. While there are an infinite number of variations of community development, there are simply 5 imperatives when developing a Community Team, which is evident by comparing Surman's Constellation Model and the Jasper Community Team. Constellations or 'groups of groups' working together on certain aspects of community development, not necessarily all aspects of community development. Stewardship Group to steward the Shared Vision process, report progress on addressing needs or opportunities. Agreements to set the norms (Terms of Reference), resources (from funders) and deliverables (evaluated & measured) of the Stewardship Group. Golden Community Resources Society (GCRS) has been awarded funding through Golden & Area A's CBT Community Initiatives & Affected Areas Program (CIP/AAP) to execute Community Team Prototyping with The Banff Centre's expert facilitators. Well-briefed local leaders and participants will be led through a customized, collaborative learning program that will help explore, design and test our Community Team's supporting documentation, performance 'norms' and measures. The Community Team will improve community planning, resource allocation and decision-making with respect to public organizations. Good planning needs to come from many networked groups. The hundreds-of-thousands of dollars in funds from-this-community, and for-this-community, can be allocated in a more open, collaborative and meaningful way. Please see the CBT CIP/AAP application and supporting documentation on the right side of this page. May & June: Initiate project. Provide background research - Complete. Plan for Golden-based sessions - Complete. Invite potential Community Team members. Work on deliverables in small groups. Test the variations of models. On December 18th, 2014, a group of interested and involved individuals came together to look at collaboration past, present and future in Golden & Area A. Find their notes and resource documents below! 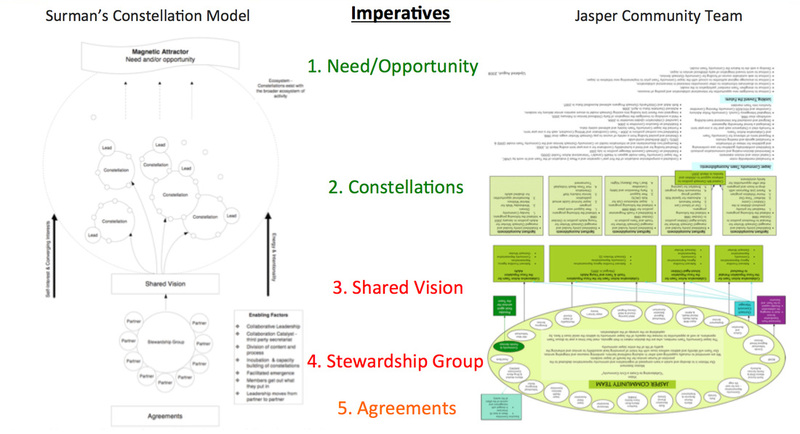 The Meeting's PowerPoint presentation (above and on the right) is built on the previous work on Community Coordination, the Constellation Model, best practices in leadership development, a proposed approach for Golden & CBT's Community-Directed Funds, and a proposed Community Team Job Description. Below, that Joy Orr has adapted some other reference documents from Revelstoke for a Community Social Development Coordinator position in Golden and Terms of Reference for a Community Social Development Partnership. These documents can be found to the right. This was the first attempt of public Community Team Prototyping. This pilot helped inform the project and stakeholders for the future Prototyping activities with The Banff Centre facilitators and a more-comprehensive sample of potential Community Team members. The following questions were randomly picked by small groups at the December 18th, 2014 Meeting. 1.Health & Social Services Group: CRA requires audited Financial Statements from all Charities by 2016. How do you meet this demand? 2.Trails: As a one-time grant pre-election 2015, $250K in federal Trails funding is available for Golden. How does it get spent? 3.Arts, Culture & Heritage: A surprise bequest leaves $2M to the Historical Society. What happens next? 4.Sports & Rec: The Mount 7 Rec Plex, and the property, is sits on is deemed surplus by the Town of Golden. What happens next? 5.Seniors/Age Friendly: The Legion building is up for sale. No one will run for the Seniors Centre Society Executive. What happens next? 6.Learning: In a round of pre-election vote-buying, COTR is able to apply for a $1.5M grant to expand their campus. What happens next? 7.Business Organizations: New service staff are challenged to answer the question, "What is there to do in Golden?" What should be done? 8.Emergency: A freak rain storm in May fills the Kicking Horse River, flooding it's banks. 50 houses and 40 businesses are flooded. Outside of Emergency Services, what does the community do? 9.Government: $200K in CBT Community Directed Funds are available if there is a broad, community decision-making process created. Is it worth pursuing? How do you know? How is it executed? Participants were only given the following "groups of groups" as a framework to help starts discussions. The recommendations from this Committee went to Council on July 4, 2013. From then, discussions with CSRD Area A Director Habart stalled. Unfortunately, there has been no improvement to the CED situation in Golden & Area A. The imperatives listed above for a Community Team as a CED driver vary slightly from the imperatives from "Evaluating the Economic Development Role of BC Local Governments: A snapshot of community effort and opportunity" by UBCM (April 2010), which can be found in their entirety below. Approaches need tailor-made to reflect the diversity of regions and communities. Approaches need to be community driven and outcome focused. The opportunity exists for local governments to play a greater role in economic development. The challenge of economic development delivery is largely one of resources. Local government economic development success stories continue to grow.